Q: Aiming boys... I have a 3 month old boy. We use the toilet reducer seat at home which has a little cup to catch the urine, but when we are not at home I have trouble coordinating the holding and aiming at the same time. Any suggestions? Q: Not where we expected to be... My son is 17 months old and we have been doing EC with him since he was 2 weeks old. It doesn't seem to be working the way we expected. He has been naked at home and wears a diaper when out. Most of the time he tells us before he poops, but with only seconds to spare. Although sometimes he tells us he has to pee before he does, he usually tells us as he is going. He often doesn't want to be bothered when I know he needs to go, refuses, then pees on the floor a minute later. Am I doing something wrong? Sometimes I feel very frustrated with the situation. Q: People often talk about their baby showing signs he or she has to go to the bathroom. What are these signs? 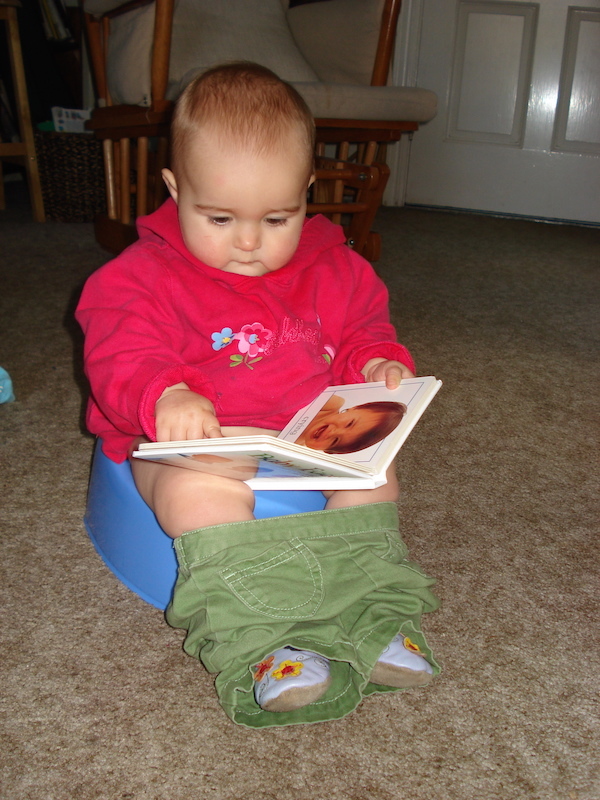 Q: If a baby doesn’t wear a diaper, isn’t it very messy? Q: What is Elimination Communication (EC)?